Epoch Times: What is this new report? What’s new and significant about it? David Matas: It’s an update on the work Ethan Gutmann and I have done. What prompted me, and I guess all of us, was that historically things are moving on, and there’s new information constantly pouring out about the stuff that we’ve already done. We needed an update just to deal with current changes and to continue to address the matters we previously addressed. We are doing something new in this update that none of us had done previously in our other investigations. In the past, we took the government of China’s transplant figures at face value and tried to figure out where those volumes were coming from; because the figures were so large, they posed a question all by themselves. This time, we went to the individual transplant hospitals in China—and there’s about a thousand of them—and tried to figure out from their publications, newsletters, websites, research reports and so on how much each hospital is doing in terms of transplants. And what we get—although not an exact figure—is a volume of transplants far larger than the official totals. That’s a new avenue of research, in addition to updating everything we’ve already done. ET: What conclusions can be drawn from those findings? 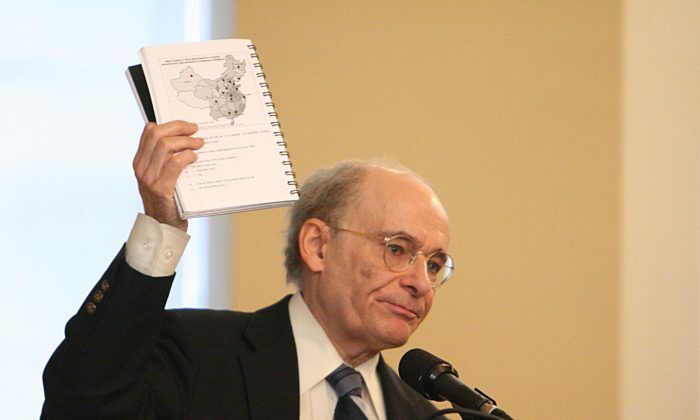 DM: Our original position was that there is an awful lot for the government of China to account for, a lot of unexplained sourcing which we attribute to Falun Gong and primarily prisoners of conscience. But the much larger numbers increases the onus and the need for accountability for the Chinese government. I would say there’s a prime—and obviously such volume, such systematic volume over across so many hospitals raises questions not only about sourcing but the complicity of the state and the Communist Party in a nationwide program of killing prisoners of conscience for their organs. And so it raises the shadow of guilt even darker, or even higher. ET: The core of the findings is a tabulation of hospital volume—but this isn’t based on hard knowledge about the actual volume in those hospitals, but estimates of the volume based on sample cases, state-mandated minimums, bed occupancy, and so on. In other words, these vast volume estimates are based on inference. Some may be dissatisfied with relying on inference on an issue as weighty as this. What do you say? DM: Of course there are difficulties when you’re dealing with Chinese data—but the data is there, we can see it, and I have no doubt that what our researchers have reported is accurate. The question is, is everything that we’ve produced real? It turns out that for instance the government of China’s figures of 10,000 transplants a year was not real. So what about all the hospital figures that produced a lot larger totals? I’m more confident that the hospital figures are real than the aggregates are real, partly because there’s much more coincidence and cross checking. It’s not just the figures, but a confluence of different sources-beds, the research reports, the newsletters—that give us the same conclusion hospital by hospital. We don’t get—just as we did with the Chinese government—just one figure from one source. We’re getting many collaborating or corroborating figures from different sources that reinforce the overall conclusion. One of the questions we’ve grappled with was the large figures from hospitals: is that a form of competitive boasting? I would say no, because first of all, there are just too many of them from different hospitals. And secondly, it’s not just the figures, but a confluence of different sources—beds, the research reports, the newsletters—that give us the same conclusion hospital by hospital. So I have a lot more confidence in what we’re doing now than previously with the Chinese government’s figures. But at the end of the day it doesn’t really fall to us—I mean it’s not our job to tell the Chinese government where it’s getting it’s organs for transplant. It’s their responsibility. It’s not just my view, but an international policy and human rights view, that it’s up to the Chinese government to account for it’s sourcing of organs. And one can see from this report even more so than from our previous works that they haven’t done that, in spades. Chinese official responses are twofold. One is they make up stuff; the second is they hide stuff. ET: What is the gap? DM: First of all, their own sourcing like everything they produce is suspect or not genuine. Generally, for the government of China, statistics is politics by other means. They don’t produce statistics as a reflection of the accuracy of data, but in order to make a political point. And the political point they’ve been trying to make through transplants, at least initially, is that they are very technologically advanced. Of course the government of China gets push-back, because people raise questions: Where are the numbers coming from? It poses a problem to them, so they have to stick with the numbers they put out—but then they start generating sourcing. When we started our initial investigation, the original claim of sourcing was donations. But there was no donation system nor distribution system. Then they shifted to prisoners sentenced to death. But they didn’t produce death penalty figures, and still don’t. But these figures are obviously available, since the death penalty is state-wide. But then of course even sourcing organs from prisoners sentenced to death is a violation of international ethics. So then they walk back to their original position and say it’s all donations. And they did set up a donation system. One of the aspects of the report that we had is having our investigators call these various donation clinics and ask how many people are donating; these clinics are either closed or nobody’s donating. So what they say is really not a plausible sourcing. Whenever we cite or quote something that’s accessible within China, it disappears. The government of China produces statistics where there is no independent way of verifying what they’re doing. At least with the hospital stuff there is some form of verification. Chinese official responses are twofold. One is they make up stuff; the second is they hide stuff. So I’ve been on this file for about 10 years now, and my experience is that whenever we cite or quote something that’s accessible within China, it disappears. And that’s what we’ve been seeing happening even as we’ve been doing this hospital by hospital search. Stuff disappears as we’re working on it, or I suspect it will disappear once the report comes out. So it’s a problem in terms of cover-up, but you’re asking what’s their explanation. From my perspective, they don’t have one. It’s flim flam. ET: Was there anything that surprised you about these findings? DM: I come from a city of three quarter of a million people and a country of 32 million people, and I’m just surprised by the scale of China. One of the things our researchers did was producing pictures of the hospitals that are doing these transplants. Transplantation in China is a huge industry, and it’s a relatively new industry. And they have no obvious sources. Why are they putting in this money to building all these institutions for transplantation when they have no obvious sources of transplants? It’s not just for organ transplants today, but they must have enough confidence to continue on into the indefinite future that they built this huge capital establishment, built on an indefinite supply of organs. From where is all the human organs coming? My answer is the millions of Falun Gong practitioners that were arbitrarily detained and then disappeared. These Chinese hospitals don’t really have a plausible other answer. ET: How do you know that the material you saw reflects actual activity in China, and isn’t just propaganda, self-promotion, etc.? And how do you know the buildings are actually being used, since a lot of infrastructure development in China might be wasteful, just to drive up local government GDP figures? DM: A building itself doesn’t tell you anything. That’s why I say we’re doing a lot of cross-checking. These buildings, they have newsletters, they have staff, and the staff have publications, and the staff do research. A lot of Chinese research is not published in standard journals because it’s not ethical research. So they establish these vanity publications that basically research without peer review; but we can look at this stuff. And these people get degrees. They must have enough confidence to continue on into the indefinite future that they built this huge capital establishment, built on an indefinite supply of organs. They may build empty buildings, but it’s unlikely that they would hire staff for these empty buildings to do nothing all the time, and produce fabricated research. But there’re so many corroborating facts working together to show that this is a big and functioning enterprise. Also, we can see within the communist five-year plans that these hospitals are a priority within the plans. It’s unlikely that the Chinese government would make them a priority and then do nothing about it. There’s a lot of corroborating facts that come to the same conclusion. ET: Looking back from 10 years earlier, how would you characterize the progress that has been made in knowledge? DM: This is the fourth major report that I’ve worked on in this area. And Ethan Gutmann has become heavily involved. I would say there’s an accumulation of interest and awareness. Recently, I got an email from someone who read “The Slaughter” [Gutmann’s book], and he asked me some questions about it. I get stuff like that every day. The advantage of working on a file this long is that the more people learn about it, they don’t disappear or unlearn it. So it becomes an accumulative weight of awareness and pressure. We’ve now got a resolution in the European Parliament. We’ve a resolution in Congress. We’ve seen in the opposite direction the Chinese government changing its tune, changing its vocabulary, doing everything to seem to be saying the right thing without doing the right thing. Some people, however, get bamboozled by that. And it’s a lot harder to convince people who don’t want to be convinced when the Chinese say what the foreign interlocutors want to hear. ET: There are a good chunk of people who are on the fence about this issue. If this all this is true, then it must be one of the greatest crimes against humanity of the 21st century. And yet if that’s so, why aren’t the major human rights organizations and the transplantation establishment doing anything about it, or even acknowledging that it’s happening? DM: I think the answers are different for the profession and the major human rights organizations. For the profession, they’re not used to dealing with human rights. I mean, they know transplants. And they can easily jump on a smoking gun. At one point, I pointed them to a website that was advertising transplantations in China—the Omar Health Care website—and that got them to write a letter to Xi Jinping. It was a decent letter, and the website got taken down. You can’t expect for human rights and rule of law in a transplant island in China in a raging sea of tyranny. And as far as some on The Transplantation Society are concerned, that was the end of the problem, when it obviously wasn’t. I was actually on a panel with Delmonico [Dr. Francis L. Delmonico, the former president of The Transplantation Society] in Rome last month, and Delmonico was talking about how he went to China, and met with some doctors and went to some hospitals, and everything seemed fine. They said the right thing, and what he saw wasn’t a problem. So they were asking me in that panel: What do you think the transplant system should be doing in China to change to be effective? And my answer to that is: you can’t expect for human rights and rule of law in a transplant island in China in a raging sea of tyranny. The only way you’re going to get a proper transplant system in China is to have a country that’s subject to rule of law, an independent judiciary, free media, and respect for human rights. And for the transplant profession, they’re not used to dealing with situations like this, and so it’s kind of more than they can take on. I would say generally, because I deal with human rights a lot, there are two kinds of responses that you get from human rights violators when you confront them with human rights violations. One is: go away, it’s none of your business. This is an internal manner. It’s foreign values. And they kind of brush you off. That was the initial response of China on this issue when we first got started. The second response, which is also very typical of violators, is: You’re right. Give us time. We’re trying to change things. We’re kind of not fully developed. Tell us how to do it. Help us. And that has been more or less the contemporary response. The result is the same. The human rights violations continue. It’s just the vocabulary that’s different. But for the transplantation profession, they’re easily bamboozled by this kind of shift in vocabulary because they’re not used to dealing with it across a bunch of countries and across a bunch of human rights violations. They see it only once in this context. You know, there’s a saying: fool me once, shame on you, fool me twice, shame on me. The transplantation profession, they’re being fooled only once, so they have difficulty getting beyond that. I think for the established human rights organizations, the answer is different. And this is a constant problem. I went to a meeting with Amnesty International in Winnipeg this past week where they brought in a speaker who has been active internationally in the movement, and he said something I’ve heard time and time again with these major organizations: We’re concerned about effectiveness, and effectiveness means getting visibility, getting funding. I’ve talked with Amnesty International in particular about China and Falun Gong. They’re concerned about the death penalty, and there’s movement with the death penalty. Death penalty offenses are down, the structure is different–it went from the regions to supreme court. But they can’t make an impact on Falun Gong or organ transplants because once you start talking Falun Gong to China, a conversation is over. So they’re doing a trade off. Their attitude is, we will go on an issue where we can have some interaction—which in the Chinese context is the death penalty and some others—and stay away from the topics that will shut the conversation down. I part ways with them on that because my attitude is that the primary target for human rights discourse should be the victims, not the perpetrators. And where the victimization is worse, that’s where you should get involved first and most. Amnesty has an institutional imperative: The very fact that they are big means that they have a big machine they’ve got to keep doing. And continually butting your head against the government of China isn’t going to work for them, so they move on to other areas where they can get some movement. ET: Same for Human Rights Watch? DM: It was an interesting phenomenon with Human Rights Watch, because they initially put out a huge report at a time when China was saying everything comes from donations. Amnesty International and Human Rights Watch are different in the sense that Amnesty International is a membership organization and Human Rights Watch isn’t. Human Rights Watch is more about research and reporting. So with Human Rights Watch, they put out a very big report on sourcing with the death penalty at a time when China was saying sourcing was donations. And this was in the late 1980s I think. Then our report comes out and as far as I’m concerned, methodologically, it’s stronger than theirs because they would use sources that we wouldn’t use, like secondary sources that weren’t identified. Part of the trouble with Human Rights Watch is that they’re not as comprehensive as Amnesty International, and they tend to move around and pick targets for research. I think they felt they’d kind of done [organ harvesting] already with the death penalty stuff, so they were just going to do something else. Also they’re probably worried as Amnesty that this research will prevent them from having effectiveness in other areas with China. ET: What’s your current understanding of the status of organ harvesting from Falun Gong in China? Is it still going on? DM: The volume continues. The mystery about the sources continues. The only obvious source I can see is prisoners of conscience. We don’t know what the death penalty figures are, but they are down, as far as I can tell, because of the movement from regional courts to the supreme court, and also the decrease in number of offenses. Part of the problem we’re facing is increasing cover-up. It’s not completely related to external pressure. One of the things that the Chinese government did in response to global concerns about sourcing organs was to set up a system of registration. There were about a thousand hospitals doing transplants before before they set up a system of registration, and then they cut it down to about 164 registered hospitals. They said you’ve got to register to do transplants. Transplantation…is the primary moneymaker for the health system. Transplantation was and is a huge moneymaker in China. It’s the primary moneymaker for the health system as far as I can tell. The government took money out of the health system in the shift from socialism to capitalism, and many of the hospitals needed this money to keep their doors open. Hospitals got into the transplant business in a big way, and then the government, partly in response to outside pressure, says they’re going to set some sort of regulation over the whole system. So they set up this registration system, but the other maybe 700 hospitals didn’t stop transplants. They tried to hide the transplantations they were doing, not just from the outside world, but also from Beijing. As far as we can tell, this phenomenon is still continuing, and it’s a lot more difficult, when there’s all this massive cover-up, to get numbers of what’s going on. We get these hospitals boasting of so many transplants per year, and you accumulate a few and get more than the government totals. But we can’t produce our own totals. ET: What’s your harvest number? DM: There are various estimates based on various assumptions. We engage in range speculations. If these many beds are used for this rate of turnover, and so on. That’s just to give you an idea of what’s possible in the current system with the current infrastructure. But that’s not an actual number. ET: That’s a range—but do you have an actual number? DM: We’re not going to produce a number or say it must be [a certain number]. I think the only thing we can say with confidence is that it is much larger than the 10,000 a year that the Chinese government have produced. The figures that we have produced in the past, which are themselves estimates of numbers of prisoners of conscience killed for their organs, number of Falun Gong killed for their organs, are way too low. But what the figures are, we can’t say, because there’re just too many variables. Take something as simple as beds. There are a lot of hospitals where we know the number of beds. And some of these hospitals have wings dedicated only to transplants. And within these transplant units they have intensive care units. So if you’re dealing with transplant bed intensive care units, you can probably, with capacity, figure out how often it’s going to turn over, because people are kept in intensive care for a relatively predictable length of time. But when it comes to the other beds, even the transplant beds, there’s substantial variation: how long before the operation are they put into the hospital, how long after the operation are they kept in the hospital. So you can’t really tell from beds, even if they’re operating at full capacity, what the transplant volume is because you don’t know the length of stay. We’re faced with problems like that. Organ harvesting may have been the Communist Party’s major method of eliminating Falun Gong—by commoditizing the bodies of Falun Gong practitioners as part of a centralized eradication program. ET: The report comes the closest so far to either showing, suggesting, or at least leaving open the possibility, that organ harvesting may have been the Communist Party’s major method of eliminating Falun Gong—by commoditizing the bodies of Falun Gong practitioners as part of a centralized eradication program. Of course, the report does not prove this, or even argue it. Do you think that is what has happened? Or do you find the “entrepreneurial,” and “organic” explanation—where hospitals around the country just went to their local prisons and labor camps and used whoever was available—the more likely? DM: I would say generally that governments rarely act for only one motive because governments involve many different people acting for many different motives. Some of them are very money based; some of them are very politicized; some of them are just following orders, and some of them are victims of the propaganda against Falun Gong. We can tell because I’ve interviewed many Falun Gong practitioners who’ve gotten out of prison in China. It’s not just money, because the Falun Gong are depersonalized and treated very badly. It also isn’t just politics, because for many of these people, it’s their career, it’s their income, it’s their families, you name it. They’re turning a blind eye because they’re benefiting from it. For many of them, it’s willful blindness because it serves their own personal and political interests. A lot of the officials that the international transplant profession are dealing with, including Huang Jiefu [the former health minister], say little or nothing about Falun Gong, and just say we don’t know where the organs are coming from because we do the insertions. We don’t do the extractions. So I don’t think one has to choose between those explanations. I think there’s a confluence of explanations that produce this result. ET: What do you hope will change after the publication of this report? DM: It will add to the database, the information about what’s happening in China. It will add, I hope, to the momentum to hold China to account. The transplant profession has been wavering. They have these bi-yearly congresses, and they’re not rejecting the China papers. And that’s a problem as far as I’m concerned because the papers are equally problematic. They’re not identifying their sources. I would say several in the transplant profession are easily beguiled by Chinese propaganda. I think peer pressure is important, and it has been effective in the past at least in getting some movement within China. I also hope that the global transplant profession would get more backbone on this issue. And of course, I’m glad to see what happened in the European Parliament and what happened in the US congress, and I would like to see more of that in different legislatures across the world. I also think that when it comes to the transplant profession, it isn’t just the Transplantation Society, which is the international one, but it’s also the national ones. If more national transplantation societies took firm stands on the issue of organ harvesting, this would have an impact on the profession. There are other things that should happen like immigration controls, or the publishing of or not publishing of articles, training or not training of transplantation professionals in China and so on. One has to think about the various ways in which one can impact on this from abroad and try them all, and hopefully those efforts will increase as a result of what we’re doing. ET: If people only had 30 minutes to look at this report and evaluate this issue, what would you suggest they focus on in their reading of this new report? Which chapters, and which issues? DM: To a certain extent, the length of the report was intentional. Obviously, we could have produced a shorter report, but what you’re dealing with here is cover-up and denial on the Chinese side. And simply getting this into a “he said, she said” debate doesn’t really get us very far because it looks like some sort of quarrel, and it’s hard to take sides. The impression I would like people to get coming away from this report is that the evidence is overwhelming on our side of the equation. If they’ve any doubts, they can read it, word for word, page for page, hundreds of pages after hundreds of pages. But if they don’t want to do it, then they shouldn’t argue with us that the evidence isn’t there. ET: You are documenting enormous, mind-boggling crimes. Are you concerned that the response from the public will not correspond to the severity of what you document? DM: Sure, I mean this is always true with a massive human rights violation is that a lot of people don’t care. They’re more concerned with whether their neighbor cuts their lawn than whether millions of people are being murdered abroad. That’s to a certain extent human nature. We have to deal with it. ET: How about the elite—human rights professionals, journalists, and so on? Even they may not read the report in full. What is the report in a nutshell? DM: What we’re saying is that there is a huge volume of transplants, from unexplained sources, and the evidence points to prisoners of conscience, primarily Falun Gong, as the source. That’s what we’re saying in a nutshell, and if they have any doubt about that, there’s lots of evidence, more than they can possibly want, to support it.